The little settlement of Puerto Eden, home to fewer than 200 hearty souls, was the first town of any sort we’d seen in a week, and we rolled in there yesterday on a radiant, sun-splashed morning – also the first of its kind in quite some time – to take on fuel and have a look around. If you happen to be sailing Around the Americas, Puerto Eden will immediately bring to mind another rugged fishing town, also claimed from the rugged coast by sheer determination and interconnected entirely by boardwalk, the Alaskan outpost of Elfin Cove. The no-nonsense guy who rolled the two 50-gallon diesel drums down the dock (it was all that was available on rather short notice) had the map of Chile drawn on his mug, and he took care of business quickly and efficiently. Mate Dave Logan, who hates fueling the boat like dogs hate fleas, was impressed by the whole operation, and that’s saying something. “Wish they were all like this,” he said. Yes, Jose Navero Leiva was quite a fellow, and we were to learn many interesting things from him, but my memorable moment with the man came as I was walking through town a little later on. I ran into him at a bend in the boardwalk, next to a small, well-tended plot of mountain flowers, and in my best correspondence school Spanish, attempted to engage him in conversation. “Muy bien garden,” I said. More fast syllables. Hundreds of them. This wasn’t going well. Then, suddenly, being the brighter of the two bulbs in this strange conversation, he got it. He scrunched up his face, puzzled, but then his eyes began to twinkle and he shook his head with a grin. Whether he was genuinely amused or just humoring the lame gringo, I’ll never know…or care. The smile that followed, begrudging or not, was every bit as bright as the bright, sunny day. Today, Ocean Watch is anchored in a sensational bay called Puerto Larenas, tucked up a deep fjord on an island named Merino Jarpa. Earlier this morning, three members of our Cape Horn crew – Sailors for the Sea board members David Rockefeller, Jr., David Treadway and David Cabot – stepped on a charter boat here in the cove to return to civilization. Our original schedule called for all of us to arrive in the city of Puerto Montt tomorrow, but alas, Puerto Montt is still four hundred miles away. Between here and there lies a significant body of open water, the Golfo de Penas, and today that gulf is being wracked by a powerful northerly gale, the reason for our forced relaxation. The new plan is to set sail tomorrow, also known, in some distant, almost forgotten land, as Super Bowl Sunday. But first, we’ll recap the last two eventful days. Skipper Mark Schrader addressed this rather significant milestone in his personal skipper’s log. The Forties, however, greeted us not with a bang, but with a drizzly shower. That night, we anchored in a small cove not far from Puerto Eden so we’d have but a short trip to refuel in the morning. On the way in, we spotted a real, honest-to-goodness man-made shelter…a sturdy dock and a small “cabin” on a stunning, woody headland. No sooner was the hook down than Mark, Logan, David Thoreson and I were into the dinghy and kicking around the rustic fish camp, littered with huge chunks of firewood and the emptied shells of ten thousand mussels. The place was in need of attention, but the outward view of the long, tall fjord, was astounding; if you were quiet, you could hear the fire crackling, the drinks flowing, and the laughter of friends and kids far, far away from the world. The tiny burg of Puerto Eden, twenty-five miles up the coast, was surely the source of that camp, and the little town, quiet and picturesque, was every bit as unexpected and incongruous. We ended up there with most of a day to kill, as the next stretch of the canal included a narrow, tide-swept strait that could only be negotiated on a fair tide, in yesterday’s instance, at 7:30 in the evening. So we all strolled down the narrow walkways, had a glance at the meager shelves in the small supermercados, bought a few small items – including warm, fresh bread! – and took on at least a bit more fresh fuel. And that’s how we made the acquaintance of the merchant, gardener and local historian, Jose Navero Leiva. “Puerto Eden is a community of 160 with a school-age population of 14. The school is new and quite large, compared to the other buildings lining the waterfront. Streets don’t exist; the town is perched on the side of a gently sloping hillside and the sidewalk is actually a boardwalk partially cantilevered over an interesting shoreline. The jetty OW used is relatively new, built for a ferry which stops twice a week – that’s once in each direction – bringing everything from drums of fuel to fresh vegetables and mail to the town. And, we’re told, there is a new hotel/hostel just across the bay, waiting for the influx of tourists from, well, that’s the problem. “According to a long-time local resident with family ties to the community (Jose), this town is going through changes not dissimilar to those we encountered in the far north. Not long ago residents here could support themselves by fishing and selling their catch to markets in cities connected to them by regular ferry service. They charged a fair price for a quality product, delivered fresh to happy customers in distant places. Commercial fish farms have changed all of that for the fishermen of Puerto Eden. Farms are producing and selling fish for less than it costs these fishermen to catch them. It seems no one is interested in buying more expensive wild, fresh caught product. At day’s end, loaded with fresh experiences, Ocean Watch was a yacht in transition, to the deep, incredible bay known as Puerto Larenas, to offload our mates and, our recurring Chilean nightmare and reality, wait on the weather. It was an all-night run to get here, and we arrived just after 7 a.m. local time. The waters in the inlet were still and flat; a small cruising boat with an anchor down, and two stern lines tied off the trees, was nestled in the head of the bay. An hour later, a big, blue motor launch, the Huemules, hove into view. At this stage of the voyage, we’ve had many guest crew on board – scientists, teachers, friends, family – but none have been as familiar with the ropes and the pace of life onboard as David, Ned and David. It’s always hard waving bye to our mates, and this morning was no different. We had a one fine adventure off Cape Horn. That said, it sure was quiet once they left! We were all dog-tired after the all-night run, but I couldn’t resist tossing my Little Wing kayak into the drink. I paddled over to the cruising boat, just getting under way, and apologized to the gracious couple for all our ruinous commotion. They just laughed, and seemed pretty pleased when I told them if they sent me an email, they’d have one sensational David Thoreson picture of their boat in its quiet corner as recompense for our intrusion. Then I paddled a ways alongside Huemeles for a while and bid one final farewell to our mates, bound in the short term for Puerto Varas, and then back to the real world. It’s a place I’m not quite ready for. As the hum of the engines slowly faded, then disappeared altogether, I sat there a long while, listening to the patter of light rain on the flat sea, and the trickle of a waterfall down the rocks. I’ll take one very brief moment here to rhapsodize on the joys of a simple sea kayak. Sailing will always be my first love, but paddling has become a close second. It is, in turns, simple, hard, peaceful, challenging…but always beautiful. It puts you next to the water, literally, and to the birds and sea life therein in a way that’s impossible in any other craft. It’s relatively inexpensive to get into (especially compared to sailing!) and easy to learn (though, like everything worthwhile, you need to put in the hours to get good at it). If you’ve never been, and you love the water, I implore you – all right, I’m begging you! – do yourself a big favor and get in a sea kayak. You won’t regret it. That’s what I did this morning. A couple hours later, on the way back to Ocean Watch, David T was on the bow, camera in hand, and told me to keep paddling. To say the sea was like a mirror would be to diminish the reflective power of mirrors. Everywhere I looked, I had a double view of the mountains and the trees, the sea and the sky…one above, and one below. I felt like cover art for an old Yes album, like I’d discovered a high-latitude paradise, a waterborne Garden of Eden. David’s kaleidoscopic photos tell the story better than I can. I paddled close to shore, stopped, shipped the paddle and just let her drift. I was at the very interface of sea and sky, suspended in space, the only sound the gentle, barely discernible hiss of the hull skimming the invisible boundary between the two. A question occurred to me, unanswerable, but worth considering. Just how lucky can one man be? The cloud-enshrouded mountainous island loomed above as we sailed by on gray ominous seas. 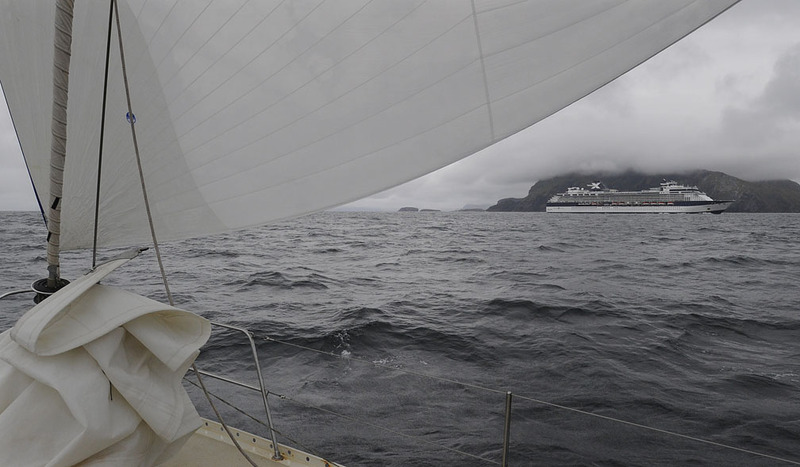 We were rounding Cape Horn, the wild dream and nightmare of generations of sailors. All of us on Ocean Watch were feeling a surge of pride and relief. We bowed our heads in reverent silence for the hardy sailors who have gone before us, those who made it and those who didn’t. And we celebrated with exuberant high fives, early morning beers shared with the Southern Ocean, and dramatic pictures of swooping albatross, the rugged cliffs and jagged rocks. Then, emerging out of the haze around the edge of the island, a moving city came plowing toward us: one of the many cruise ships that now ply these waters providing the magic and wonder of Cabo de Hornos to thousands of people a week. This was a big one, probably 2,500 of our fellow adventurers preserving their memories with a snap of the finger just like us. The sight of the cruise ship made some of us groan with dismay. It seemed somehow invasive. Our special moment of accomplishment after 18,000 miles of hard sailing felt diminished. I imagined it might be like climbing Everest and discovering at the summit tourists disembarking from a recently built tramway. Mark Schrader, our captain, recalled that – when he came to this part of the world just twenty seven years ago – the Patagonian town of Puerto Williams turned out in their Sunday best to visit him on the boat. The village had seen only a couple of hearty sailors before. Now the southernmost town in the world had a burgeoning tourist industry. David Rockefeller, the founder of Sailors for the Sea and temporary crew member, had spoken of the complexity of preserving nature and wilderness while opening access to more than the privileged few. How can we expect people to truly appreciate the delicate nature of our planet if we don’t encourage people to experience it directly? Not every one has the time, the skills, or the resources to adventure at sea the “hard way.” Yet the influx of people and ships potentially brings pollution and even destruction of fragile ecosystems. We on Ocean Watch conceived this circumnavigation of the Americas to draw attention to how our oceans and peoples are woven together, from Herschel Island in the Northwest Passage to Herschel Island near Cape Horn. As David Rockefeller has called it, “One island, one ocean – the Isle of Americas.” Our oceans and our lands are at risk from over fishing, acidification, sea level rise, and coastal pollution. Most critically, the threat to our oceans imperils our very survival. I am concerned as an educator about how we train ourselves and our children to treasure Planet Home and participate in nature without destroying it. As the two Cape Horn ships passed, starboard to starboard, exchanging salvos of flashbulbs, our crew acknowledged the inevitable march of “progress” and our shared humanity with those on the ship who wanted their own taste of the “wild.” While appreciating that this new industry brings jobs to an historically impoverished part of the world, we worried that tourists were swamping the very wilderness they were coming to see. Just as the spreading population of the rest of the Americas has impacted its natural climate and ecosystems, this small patch of wilderness is being irrevocably changed by its new visitors. As we left the Horn and the cruise ship in our wake, we hoped that all of us – sailors and passengers alike – would protect these ferocious and fragile islands and their surrounding waters.